Super pHactor supports your energy levels and encourages your body’s natural detoxification processes. Find out how SUPER FOODS provide life-changing nutrition! 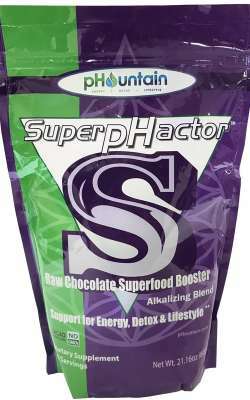 Super pHactor is a fully alkalizing blend of superfoods including: cacao beans, maca roots, turmeric, goji berries, cinnamon, banana, green tea leaf, yerba mate leaf, sunflower lecithin, chia seeds, flax seed, hulled hemp seeds, brown rice protein, garcinia cambogia fruit, chanca piedra, moringa lead, acidophilus and guar gum.